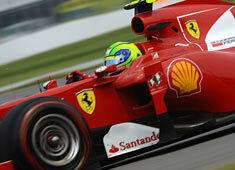 Felipe Massa topped the times in the second free practice today in preparation for the British GP. The weather was again mixed with nearly no action in the first half hour. Later on the track dried slightly and the best times were set on the intermediate Pirellis.